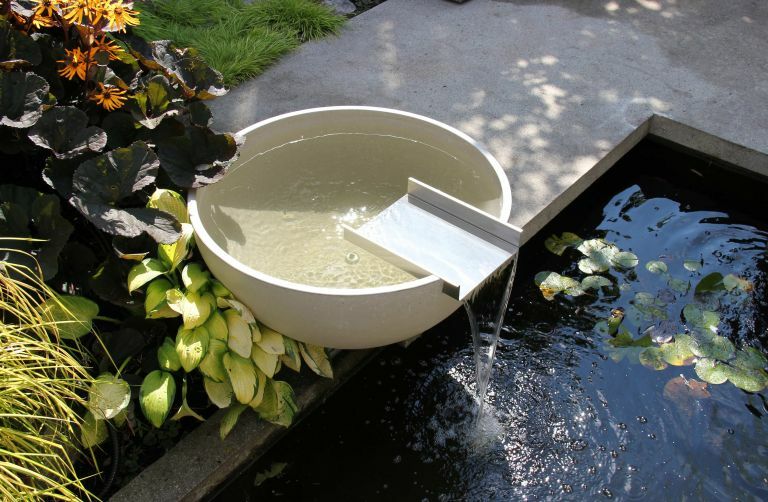 Thinking of installing a water feature but don’t know where to start? Follow our advice on what to consider, whether your space is big or small. From location and design details to electrical safety, we advise on what you need to know when planning to install a water feature. If you are installing a water feature as part of a larger garden design project, find out how to plan, design and cost your garden transformation. Water features can suit gardens and patios of all shapes, sizes and styles. Scale and style are key considerations, with large pools best suited to open spaces and self-circulating fountains ideal for smaller courtyards. A water feature is an ideal focal point in the garden, the sound of water an attractive feature for many people. Try to avoid a sunny location as it can encourage weed growth, especially in the damp environment of a water feature. Don’t place it near a tree, either, as the leaf fall will pollute the water. ‘Think safety if you decide on a water feature in a pond, particularly with young children using the garden,’ advises Sue Frost of the design team at Squires Garden Centres. Self-contained features, such as a water bowl or small fountain, are best suited for smaller gardens, courtyards and patios where space is at a premium. They add water to a garden but are very frugal when it comes to space, so won’t overwhelm the garden. Learn more about creating the perfect patio. Due to the weight of some water features and dealing with outdoor electrics, it is normally best to hire professionals for installation, as they should have the correct equipment to lift and install the fountain and expertise to ensure it is fully functioning. This should also save any long-term problems that may arise with an incorrect installation. Having said that, most suppliers provide technical instructions to show how everything fits together, so such a project is certainly not beyond the means of a capable DIY enthusiast. There is a much greater risk when electrics are run outdoors, which is why all cabling and equipment need a Residual Current Device (RCD) fitted at the fuse box to protect both the cabling and equipment that are being installed. The RCD is vital, because it will immediately cut off the electricity supply if a fault is detected. If the wiring is being run underground, it must be buried deep enough to avoid being cut by gardening tools – it should be covered with cable ties or tape to ensure maximum safety. Outdoor plug sockets should always be weatherproof so that they’re protected from the elements. If hiring an electrician, you should use an electrician registered with a Government approved scheme such as NICEIC, because of the risk associated with outdoor electrics. After the work has been done, the electrician will issue a certificate declaring that it complies with wiring regulations. A Building Compliance Certificate confirming the work meets the requirements of building regulations, ensuring that it is safe and legal, will follow. Garden lighting can be used to great effect on water features, especially on late summer evenings when entertaining. Subtle lighting from below can create a lovely ambience and, of course, has a practical function when the sun goes down. For larger gardens and landscapes, centrepiece fountains that require a pool surround continue to prove very popular. For smaller gardens, self-circulating water features are undoubtedly ideal as they require minimum maintenance and can fit into a more compact space while still looking impressive. Check out our top tips for making small gardens feel bigger (and better). Will my utility bills go up with a water feature? The electricity cost of running a water feature is minimal as fountains are normally turned off overnight and during the winter. In reality, the power needed to run fountains is normally far less than expected. Self-circulating fountains only need water topping up in windy or very hot weather, and even large water features with grand pool surrounds recycle the water round and round. Live in a period property? Have a look at these ways to make an old home more energy efficient. Larger fountains can be planted with aquatic plants, fish can be added and water species will, in time, choose your fountain as a habitat. Also, birds like to bathe, drink or swim in water features, and hedgehogs can drink from them as well. Get more tips on creating a wildlife garden.